Xavier is a piper from the North-Finistère (Lambader, 29). He started learning the bagpipes in Landivisiau aged 10 with Erwan Ropars and then Herve Le Floc’h. In 2001, he joined the bagad Landerneau with Daniel Moign and Sylvain Hamon thereafter. He is currently a member of Bagad Cap Caval (2008, 2009, 2010, 2015, 2016, 2017 bagad champions). He played with Cap Caval Pipe Band since 2000 and also with the Shotts & Dykehead Pipe Band in 2007 and 2008. 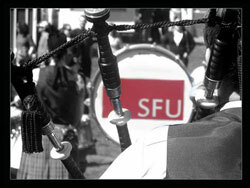 He is now a member of Simon Fraser University Pipe Band. 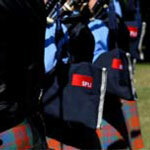 Since 2007, he won numerous awards in solo competitions (Kamloops, Seattle, Glenisla, Lonach, Oban, Inverness, London …) and won the World Pipe Band Championships with Simon Fraser University Pipe Band in 2009. He develops the RedWood reeds in collaboration with Jakez Boderiou; they are hybrid drone reeds between traditional cane reeds and synthetic reeds. In 2011, he released the Boderiou pipe chanters (band and solo, including a bagad chanter model). Since 2013, Boderiou Bagpipes are released and now available through www.boderiou-bagpipes.com. This year we are able to provide a top Breton pipe instructor during our second week. Xavier Boderiou is a name that some of you will know. 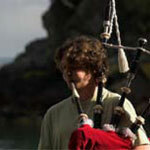 Xavier is one of the top pipers in Europe and has sparkling fingers. He piped in Shotts and Dykehead for two seasons and is now a piper in SFU and will be competing with us at the Worlds in August. He is also a very accomplished Breton piper. Sessions can be focused on Scottish or Breton repertoire, on group management, listening and maintenance of the instrument.